What Is NasiVent Tube Plus? Snoring is an issue that affects many people but some seem to suffer from it more than others. Snoring can become a serious problem and it can definitely reduce your quality of life, not to mention the quality of sleep. Snoring aids like the one we’re about to introduce through our NasiVent Tube Plus review definitely address this problem correctly. This anti-snoring solution is definitely one of the best snoring aids you will find on the market right now. Some people experience snoring not because of obesity or other health factors but because their nasal passages tend to collapse when they sleep on the side. Sleeping on the side is generally the most recommended position, but if the nostrils collapse, it becomes difficult to breathe and we automatically turn on our back. Sleeping on your back, however, is a sure way to start snoring. This is why some snoring aids, like NasiVent Tube Plus, address the initial issue, which is the partial closing of the nostrils and nasal passages. 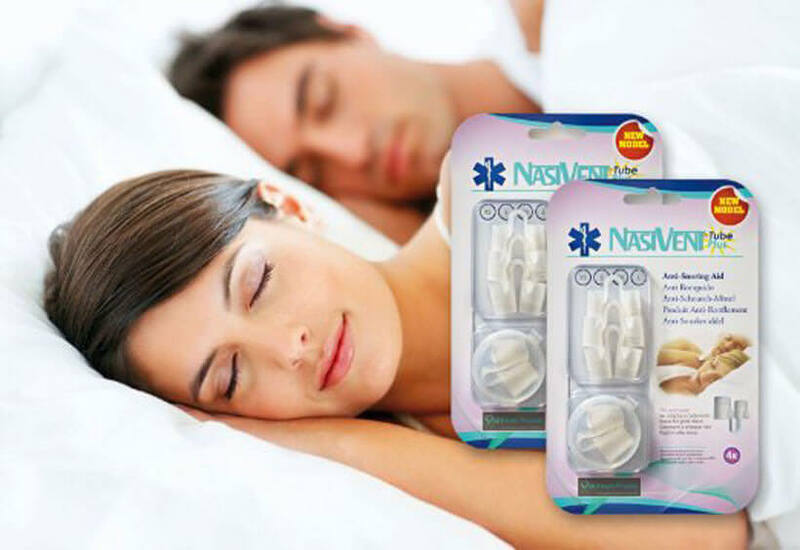 NasiVent Tube Plus is a snoring aid that can be classified as a nasal dilator. It works by opening up the nostrils, which tend to collapse due to weakness or other reasons. These tubes support the walls of the nose, especially the nostrils, and keep them open as you sleep. 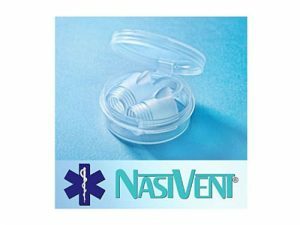 NasiVent Tube Plus nasal tubes are made of 100% medical-grade silicone, which means they are absolutely safe and will not cause irritation or allergies. They are also very soft and comfortable and do not cause any side effects. Since it doesn’t make sense for everyone to wear nasal tubes of the same size, the package contains four different sizes, from XS to L. It is recommended to start with the smallest ones and to work your way up if those don’t solve your issues or keep falling out. NasiVent Tube Plus is generally a one-time purchase. They are very durable and can last you a lifetime, as the manufacturer states. First of all, many nasal dilators are made of simple plastic and sometimes they even contain latex. 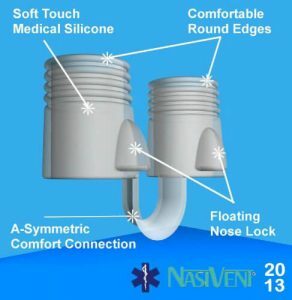 NasiVent Tube Plus is made of silicone and is, therefore, much safer and more comfortable. Second, thanks to the new and improved design, NasiVent Tube Plus is not as likely to fall out during sleep as some other nasal snoring aids. These tubes feature a nose lock, which is a small protrusion that helps the tubes stay in place. The connection between two tubes prevents them from going in too deep. This snoring aid is improved for additional comfort, too. Also, the tubes have nicely designed round edges and they are more anatomically similar to the natural shape of your nose. As we mentioned earlier in this NasuVent Tube Plus review, these nasal dilators are very comfortable to wear. They are almost unnoticeable from the outside and once you find the perfect fit by trying out different sizes, you will forget you’re even wearing them. The correct way to use these nasal dilators is to place one tube into each nostril. The tubes are connected with a thin soft link that also acts as a separator so you don’t have to worry about accidentally inhaling them. These tubes stay in place much better than other nasal dilators, especially if you are using the correct size. These tubes can last a long time with proper maintenance. Do not sterilize them in boiling water as it might damage them. Simply rinse them under warm or hot running water each morning after you take them out and occasionally wash them with some mild detergent. Do not place them in the dishwasher because you might risk losing them. The package containing NasiVent Tube Plus in four different sizes costs $12.25 and the set of two nasal tubes in the size of your choice is $14.95. You also get a little plastic case to store your nasal tubes when you are not using them. If you are still unsure if NasiVent Tube Plus is right for you, check out the key advantages and flaws of this snoring aid. After reading our NasiVent Tube Plus review, you must’ve seen what a great product it is for all those interested in purchasing nasal dilators to solve their snoring problem. It is a high-quality product that is easy to use. It is also extremely comfortable. The price is pretty much standard for this kind of product and there is a wide variety of sizes to choose from. Our ratings are the result of an objective and independent evaluation of NasiVent Tube Plus, generating the final rating that reflects the overall quality of the company. Ratings may change as the product introduces changes. NasiVent Tube Plus user rating based on 4 user reviews. We found 0 verified NasiVent Tube Plus discounts for April, 2019. There are no NasiVent Tube Plus coupons or discounts right now. In order to be sure that NasiVent Tube Plus truly is the best solution for your snoring troubles, you need to know what makes it superior or inferior to its alternatives. Discover how NasiVent Tube Plus compares to other popular snoring aids of its kind with our detailed feature and price comparisons and easily determine whether you are making the right choice.